The first works Rauschenberg produced on Captiva Island were Cardboards (1971–72), a series of sculptural reliefs composed of salvaged cardboard boxes, and Cardbirds (1971), a related series of printed and collaged multiples. Both were exhibited in New York in the fall of 1971, prior to the completion of the Cardboards in 1972. In early summer 1972 he initiated a new series, Venetians (1972–73), which incorporated salvaged cardboard with a wide range of other materials, including fabric, burlap, tape, string, metal, and found objects. The majority of the resulting pieces were reliefs, or were otherwise structured in relationship to the wall, while a few were fully freestanding sculptures. Also in 1973 he traveled to the Moulin à Papier Richard de Bas, a paper mill in Ambert, France, to produce Pages and Fuses, two bodies of work made from formed paper pulp, some of them including implanted strings, textiles, and printed images. These series, which were editioned by Gemini G.E.L. in 1974, were followed by the Early Egyptian Series (1973–74), a group of works that are generally more fully sculptural and in many cases are coated with a sand mixture.4 The titling of the Cardboards is straightforward, referencing and giving primacy to the material of the works. The titling of the Venetians series introduces potential associative and metaphorical readings. Rauschenberg clearly had a strong relationship to Venice; he was awarded the International Grand Prize in Painting at the Venice Biennale in 1964, and he made numerous subsequent visits to the city.5 He had never visited Egypt,6 however, and it is unclear why he would have referenced it in a series title, apart from the new and frequent use of sand in that group of works. Untitled (1973) superbly represents these early Captiva Island pressed works. From a distance and with a cursory look, this large and richly worked collage appears to have a loosely organized composition that suggests a quick and improvisational structure. However, close inspection reveals that an extended series of deliberate structural devices and cumulative processes was used in making the piece. Quickly apparent are the horizontal and vertical fold marks that divide the sheet into a somewhat asymmetrical grid. An extremely complex composition emerges upon further inspection, evident in traces of the tearing, lifting, and transfer methods used to shape the thickly textured paper ground. Other paper elements, most notably a variety of envelopes and bags, have been adhered to this surface and by turns pressed and transferred in fragments between the sides of the work. 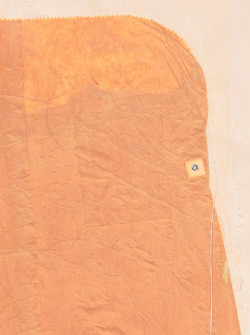 Additional paper bags were added after the initial pressing; this is most visible in the lower section, where five of them appear outlined in pencil and overpainted, four in white and one a dramatic red-orange. 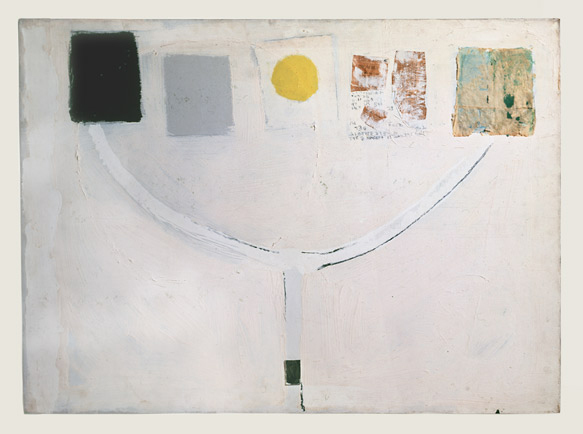 Above and to the right of the bags is a white band that appears to be a collage but is in fact painted, an illusionistic device seen in Rauschenberg’s work since the 1950s (fig. 3). 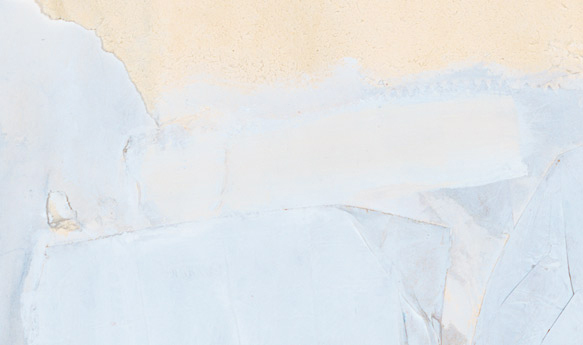 A vertically oriented area near the center of the composition has been filled in with a wash of white paint. Drips of white paint and watery droplets of pigment are also barely visible in other locations. The tension and ambiguity created by the juxtaposition of mechanical and handwrought interventions, chance operations and carefully composed applications, and the order and sequence of these operations and decisions cannot be resolved. Untitled (1973) fuses printmaking techniques with gestures of the hand through mark making, painting, and collage. The result is an understated composition of great formal invention that recaptures the spirit and aesthetics of Rauschenberg’s work from the early 1950s and infuses it with a new and refreshing clarity and elegance. The artist’s love of paper―a material he prized for its simultaneous commonness and variety, its multiplicity of textures and surfaces, and its array of values and meanings―is here sumptuously explored. He has combined a luxuriant, large sheet of richly crafted paper made for artistic purposes with examples of the most common, accessible paper products made for business and commerce (fig. 4). Although the completed work fuses these materials and subjects them to comparable manipulations, the distinct intrinsic properties of each are also given presence. Overall, the groups of works Rauschenberg created between 1971 and 1974―especially the works on paper―have received scant critical attention, particularly in contrast to the emphasis given to his Combines of the 1950s and early 1960s and his silkscreened paintings of the 1960s, in which a dizzying array of materials, images, and texts are joined, offering both visual feasts for the eye and a range of enigmatic, provocative meanings. Rauschenberg’s more restrained works of the early 1950s have also gained prominence within his oeuvre, due in large part to the enormously important exhibition Robert Rauschenberg: The Early 1950s, a survey organized by Walter Hopps that toured the United States from 1991 to 1993. The intimate early collages, the idea-based collaborations, the White Paintings (1951), and the Black paintings (1951–53) have likewise achieved significant stature. The time is past due for Rauschenberg’s 1970s collages, such as Untitled (1973), to join their ranks. These works share with many of his explorations from twenty years earlier a more tender, introspective character, and a propensity for subtle intricacy. Their immediacy and clarity of formal invention mark them as nuanced works of exceptional grace and power that represent yet another important turn in Rauschenberg’s protean career. See Joan Young with Susan Davidson, “Chronology,” in Robert Rauschenberg: A Retrospective, ed. Walter Hopps and Susan Davidson (New York: Solomon R. Guggenheim Museum, 1997), 571. Joan Young, “Assembled Works with Cardboard, Paper, and Fabric, 1970–1976,” in Robert Rauschenberg: A Retrospective, ed. Hopps and Davidson, 330. See also Bois, Helfenstein, and Elliott, Robert Rauschenberg: Cardboards and Related Pieces. See Mirta D’Argenzio, ed., Robert Rauschenberg: Travelling ’70 |’76 (Milan: Electa, 2008), 40. 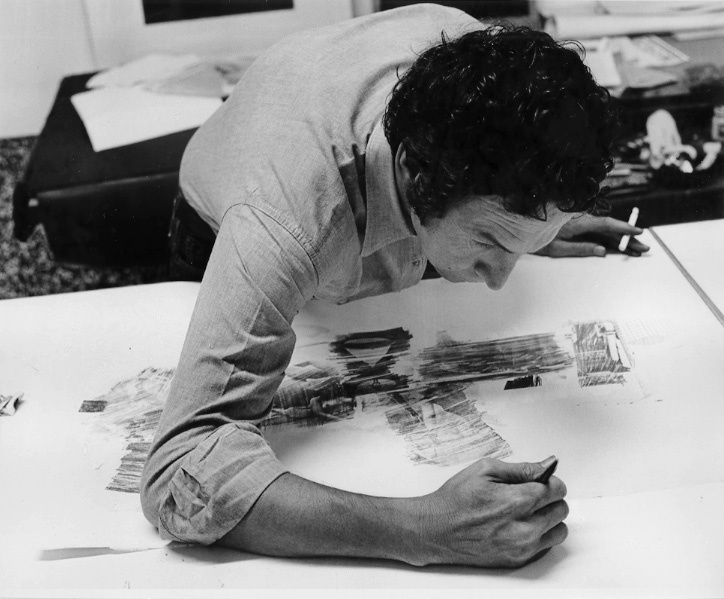 Rauschenberg met Prince Sadruddin Aga Khan of Egypt in 1972 and considered making a work on the Arab-Israeli conflict. This meeting may have contributed to the impulses behind the Egyptian-inspired series. See Young with Davidson, “Chronology,” 573. The Robert Rauschenberg Foundation currently has records of seventy-eight such works. Rauschenberg acquired two presses in the early 1970s. The first was a Fuchs & Lang printing press dubbed “Little Janis” that he obtained in spring 1971 from Captiva Island–based artist Maybelle Stamper. See Young with Davidson, “Chronology,” 572. He then acquired a second, larger press, known as “Grasshopper” for its green painted exterior. The bed of Little Janis measures twenty-four inches, while the bed of Grasshopper measures thirty-eight inches. Laurence Peterson, email to Robert S. Mattison, April 2013. It is believed that Grasshopper was used to create the Pyramid Series drawings. Cite as: Gary Garrels, “Untitled, 1973″, Rauschenberg Research Project, July 2013. Cite as: Gary Garrels, “Untitled, 1973,” Rauschenberg Research Project, July 2013.